It bears repeating: There is no free lunch. Solar advocates often say that power from the sun is free and, true enough, sunshine is not metered. But there is a cost for everything. The study found that most of California’s the 6,995 megawatts of large solar projects (for reference, the largest coal-fired plant in the U.S. is 3,564 MW) are sited in shrub or scrub land and cover a total of 375 square kilometers. Twenty-eight percent are on crop land (155 square km), and less than 15% are on “compatible” areas, that is, land that is far from transmission lines and relatively close to protected land. The study’s authors found that siting solar farms even in remote areas could “exacerbate habitat fragmentation resulting in direct and indirect ecological consequences.” The better option, the authors say, would be to site more projects in areas that have already been developed. There are many reasons to site solar farms in remote, barren areas like deserts. The most obvious is that is where the sun shines. But, as with all forms of generation, regulatory factors come into play and regulation is one of the driving factors behind the boom in solar installations. The authors estimate that to meet a target goal of reducing greenhouse gas emissions to 80% of 1990 levels by 2050 would require 500,000 megawatts of solar panels, which would cover 71,428 square km or an area roughly equivalent to state South Carolina. Before paving that particular piece of paradise, perhaps regulators should take another look at incentives. It has been said many times that putting a price on carbon dioxide would go a long way toward leveling the playing field between renewable and conventional generation sources. Perhaps land use should also be included in that equation. The Carnegie/Stanford study authors estimate that large solar plants have a land use efficiency of 35 watts per square meter. That metric has begun to show up more frequently and has appeared in at least two recent energy studies. One of them, a study by the Massachusetts Institute of Technology, calculated that the land required to provide all the United States’ electricity from solar power would be equal to the area disturbed by surface mining for coal. In another analysis, solar thermal power ranked fourth in land use intensity, right after nuclear power. 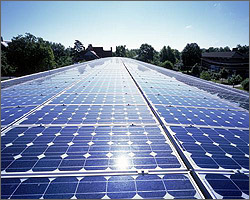 A photovoltaic solar array, on the other hand, ranks just below coal-fired generation in terms of land use. Including land use when weighing generation options could become increasingly important as solar plants and wind farms become larger and prime locations become harder to find. It could also level the playing field and result in some interesting outcomes. It might even help restore the balance between the boom in solar power installations and the steady decline in the number of nuclear plants due to early retirements. That kind of leveling could turn out to be good for the earth.